Editor’s Note: This post was written by RoadBikeReview contributor Andrew Yee, who runs Cyclocross Magazine. A modified version was originally published on www.cxmagazine.com. 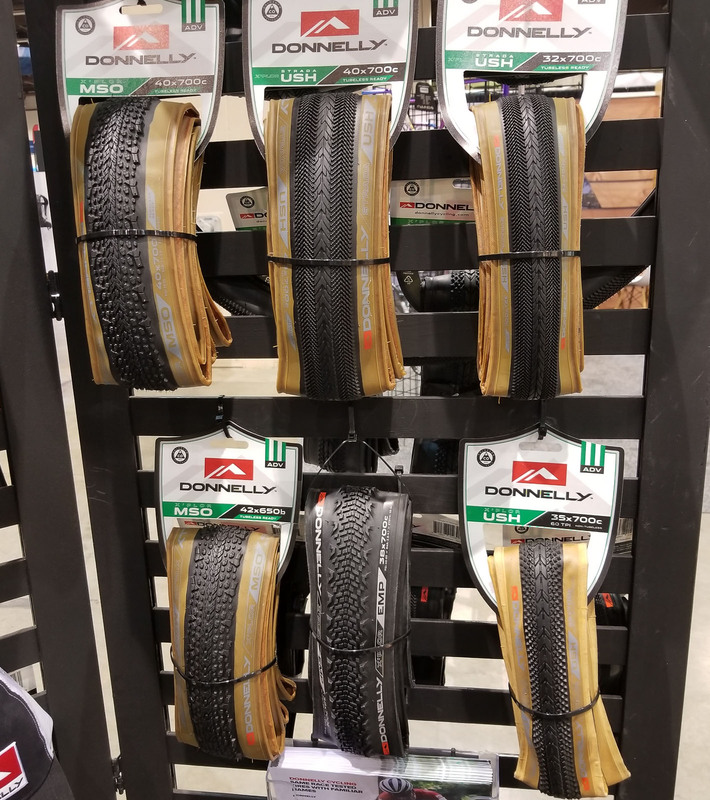 Gravel tires are one of the most exciting arenas today so we sought out new products at the Interbike tradeshow in Reno. We found creative designs and patterns plus splashes of color. Here then are some of the new treads, sizes, casings, and colors ready for your drop bar adventures. 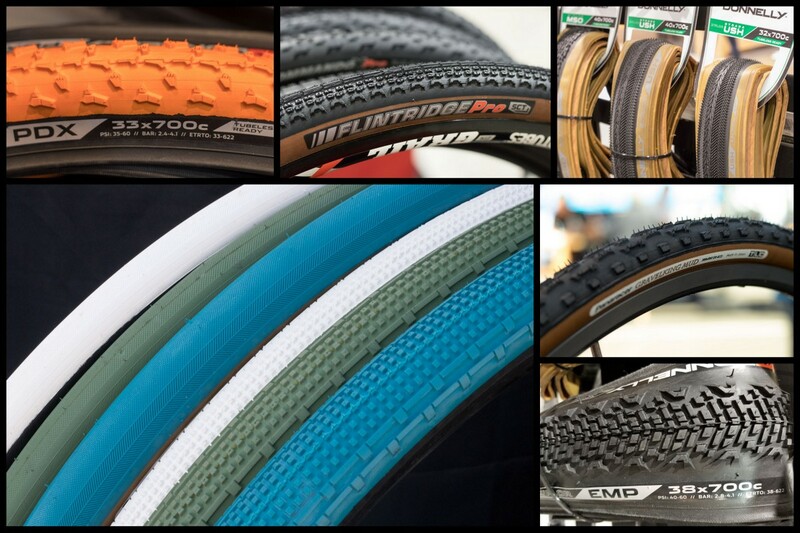 Bored with the drab colors of today’s gravel tires? 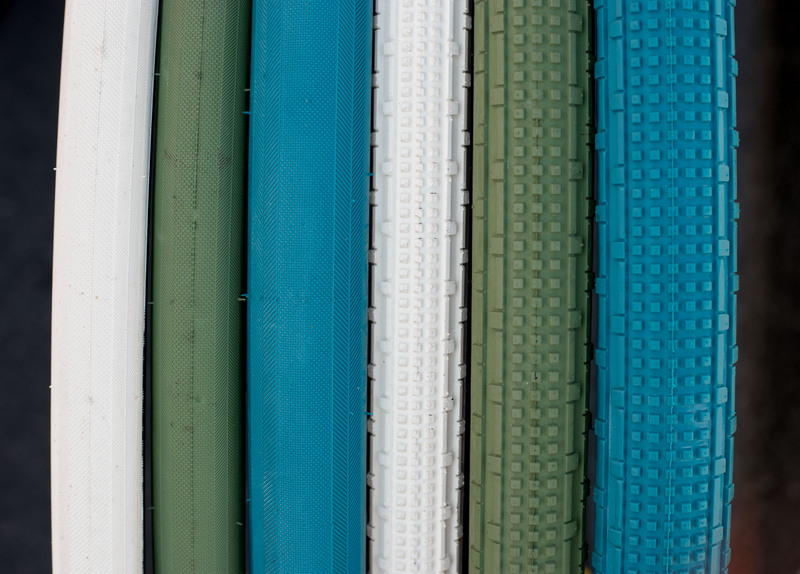 Panaracer has six new color options for the more adventuresome tire consumers. 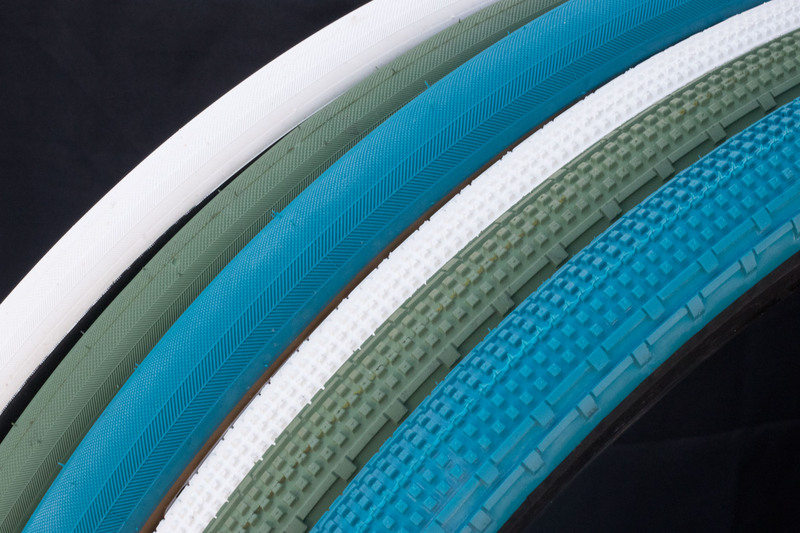 Available in limited quantities, the new colorful Gravel King tires come in three tread colors: Nile Blue, Military Green, and Ivory White. 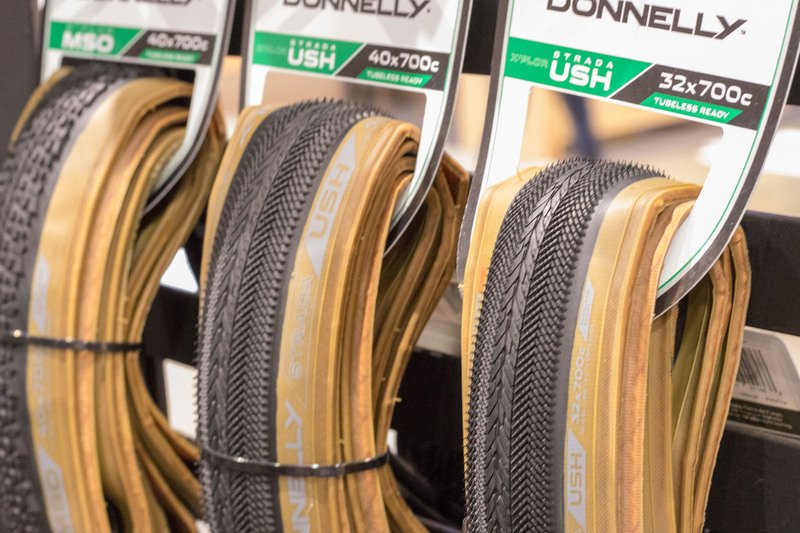 All three tread colors will come in both black and brown sidewall options. 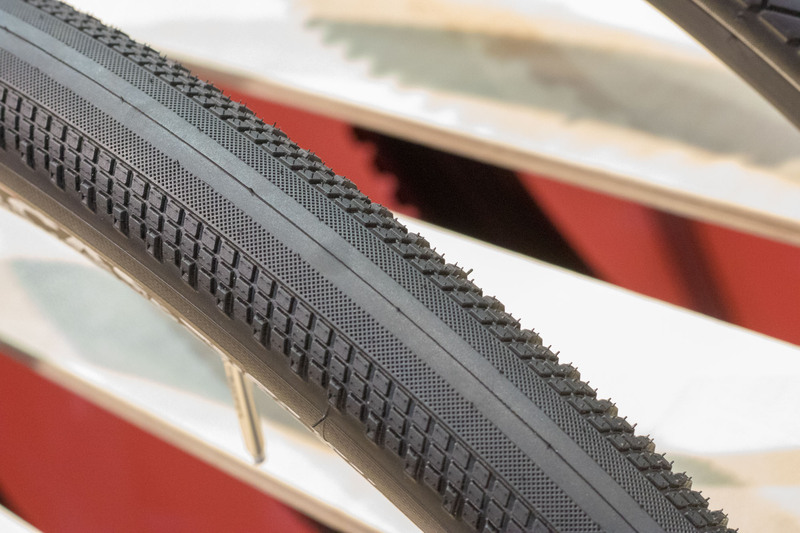 Study the labels of Panaracer’s popular Gravel King tires, and you can be forgiven for assuming the Japan-based tire company has unveiled a slew of new sizes. A while back there were 35mm and 40mm sizes, and now there are 43mm and 38mm options, but the new sizing is an update to reflect today’s wider rims. 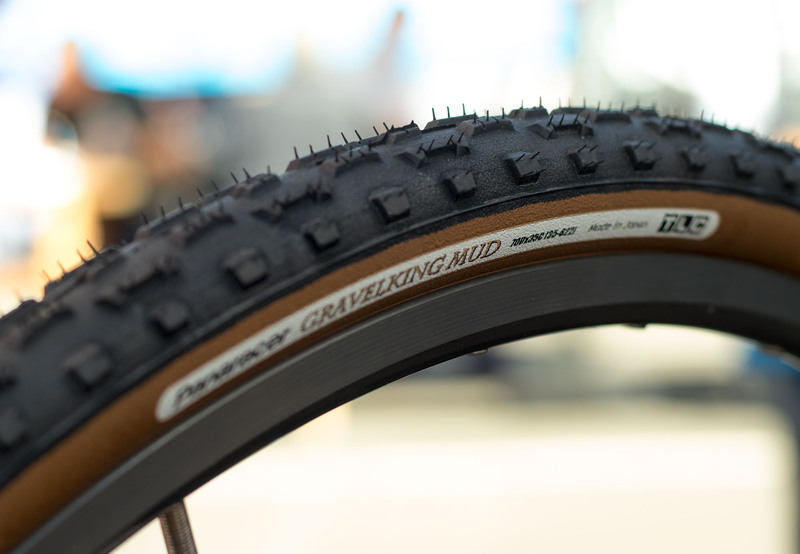 You also will start to see a new Gravel King All Conditions label soon, but the new label is a rebranding of the Gravel King Mud to better reflect the likely use for the knobby tread. 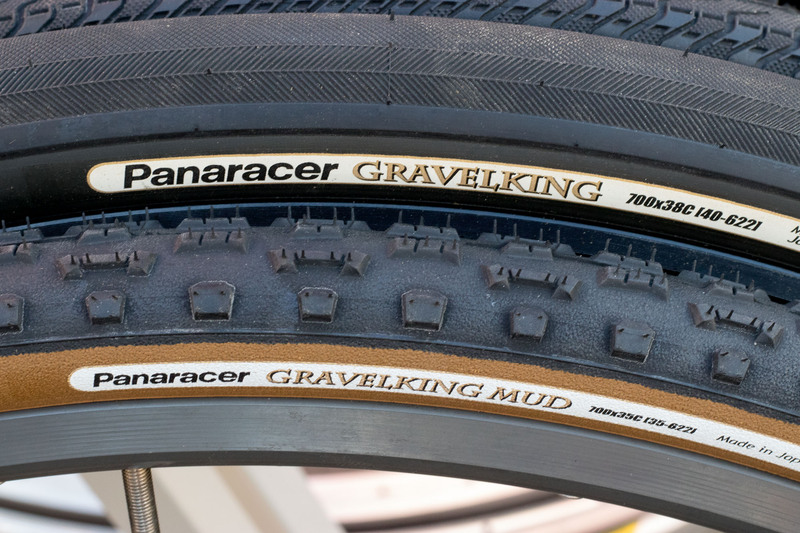 The Gravel King All Conditions is a lighter variation of the Panaracer Regacross, with the same tread but is tubeless compatible with a different construction than the Regacross. IRC has quietly been leaving its tread marks in cyclocross and gravel. 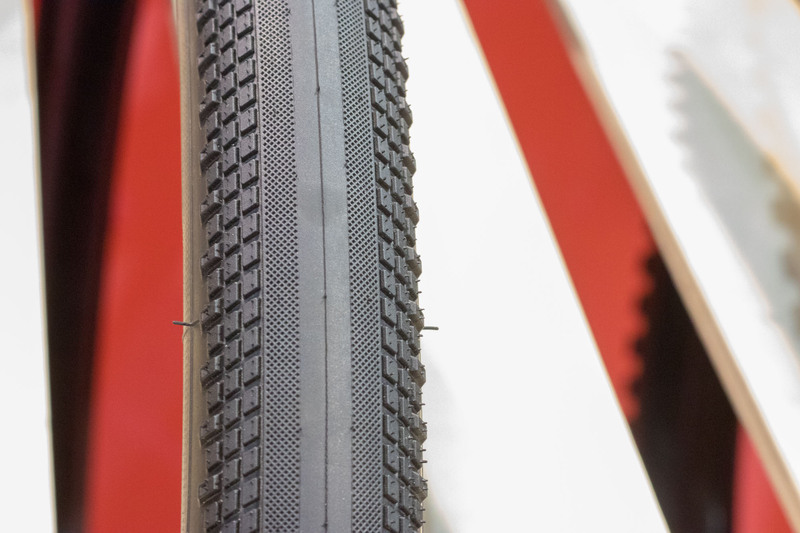 At Sea Otter 2018, we took our first look at production Boken gravel tires, and now the company has more tread and size options, as well as a new cyclocross tread. IRC has had its Serac CX, Serac CX Mud and Serac CX Sand cyclocross tires in two different tubeless casings. 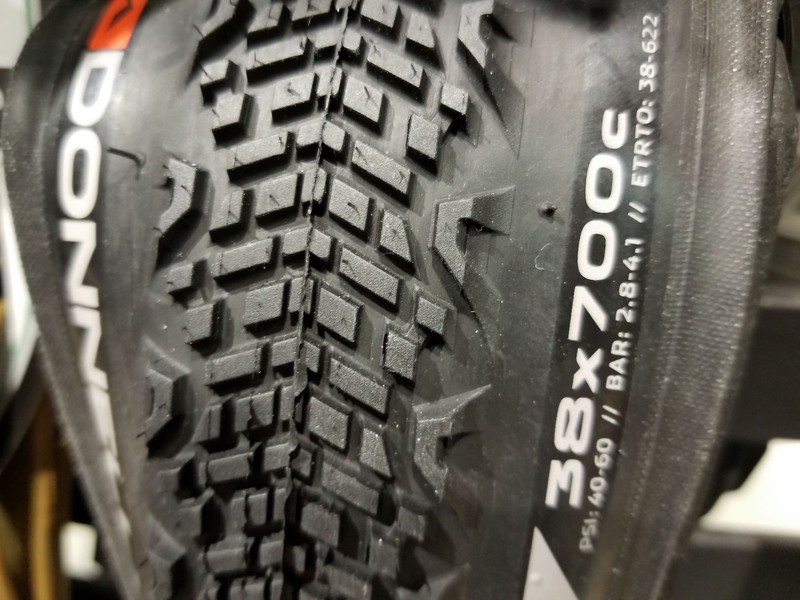 The Serac CX Sand tire is a file tread with no side knob, making it reminiscent of older Wolber tubular options and popular for sandy or icy courses. 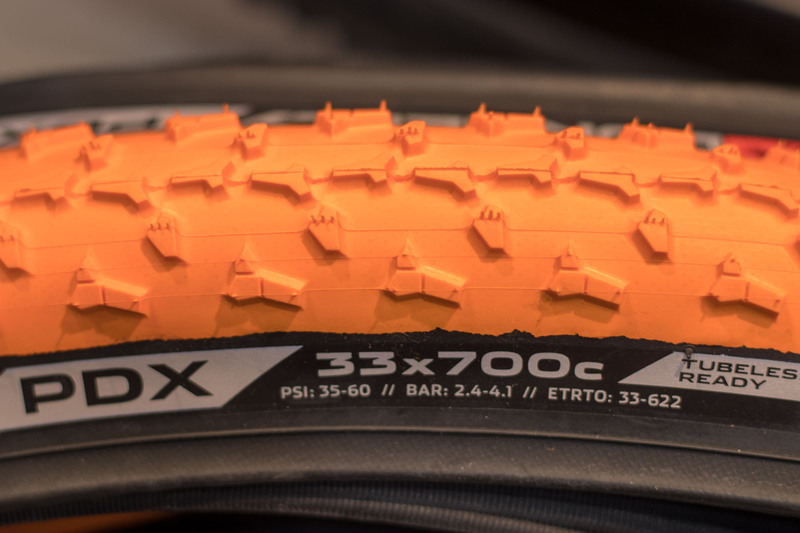 Now, IRC has added a side knob to create the Serac CX Edge tire, creating an option to compete against tires like the Donnelly LAS and Challenge Chicane. The Squid Bikes team is all tubeless this year, relying on IRC tires for its UCI racing. Thankfully, the IRC tires tend to be quite narrow, ensuring the team has no issue with UCI tire width restrictions even with wider rims. 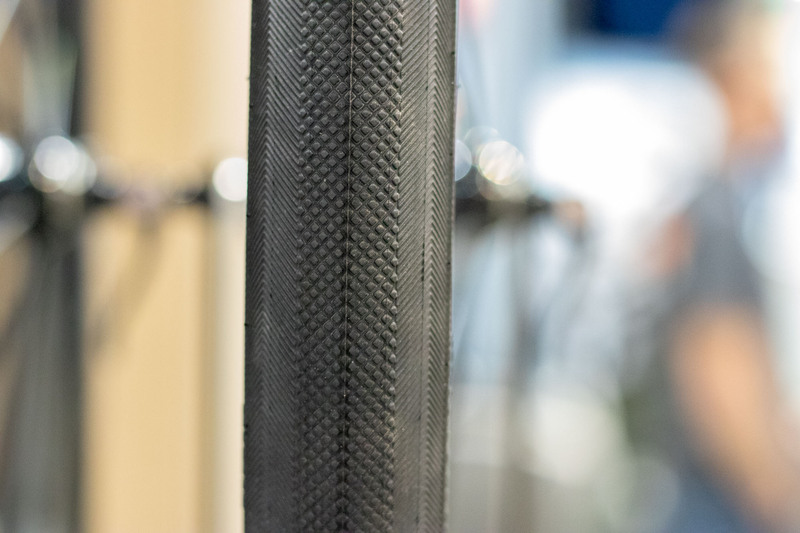 The Serac series of tires use IRC’s road tubeless bead and retail for $80 each. The company has also rolled out the Boken Plus gravel tire, with its smooth center and small side knobs. 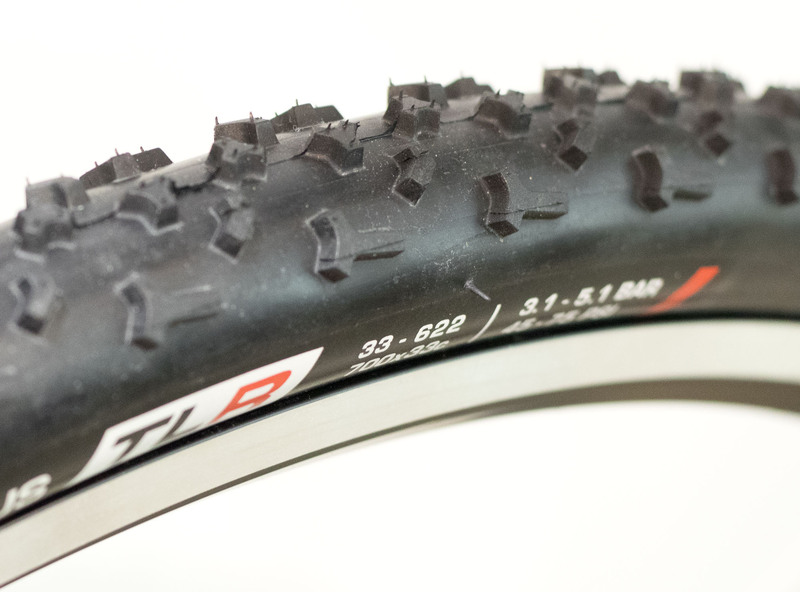 The 650b gravel option is available in 42mm and 47mm widths and will retail for $60. The Boken tires are tubeless compatible, requiring sealant, in contrast to the tubeless, more expensive casing of the Serac tires. Got an older road bike with limited tire clearance but always eyeing that dirt path on your road rides? IRC also has a new width of its Marbella tubeless tire. 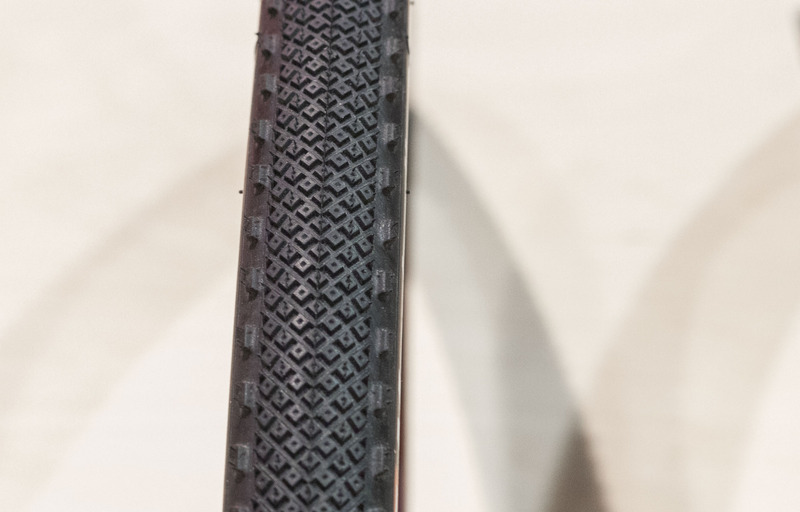 The new narrow file tread comes in 26mm and 28mm widths is tubeless with the X-Guard puncture protection casing. The new option could make a great candidate to convert a vintage ride into a gravel-worthy cruiser. The tire will retail for $70. We got our first look at the new Kenda gravel tire, the Alluvium, at Sea Otter, and now the tread is available. 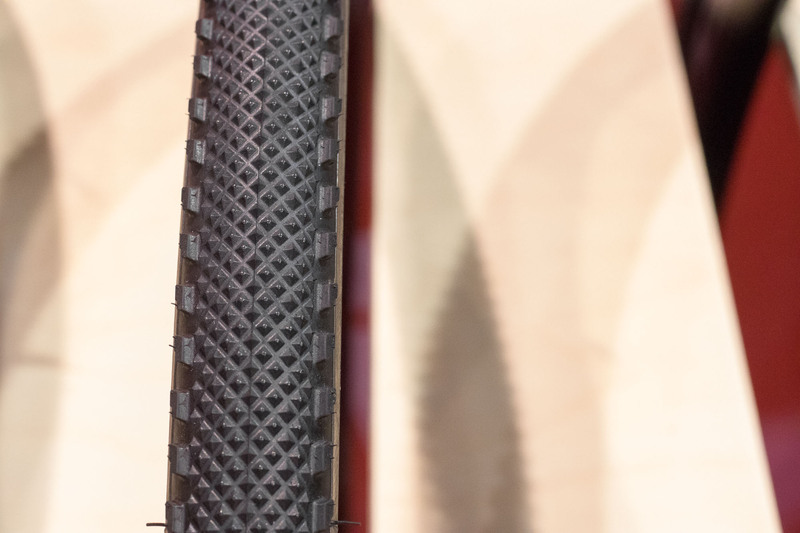 Kenda also showcased the brown sidewall version of the existing Kenda Flintridge gravel tire and suggested a new cyclocross tread may be coming in the near future. On a budget and don’t mind wire? 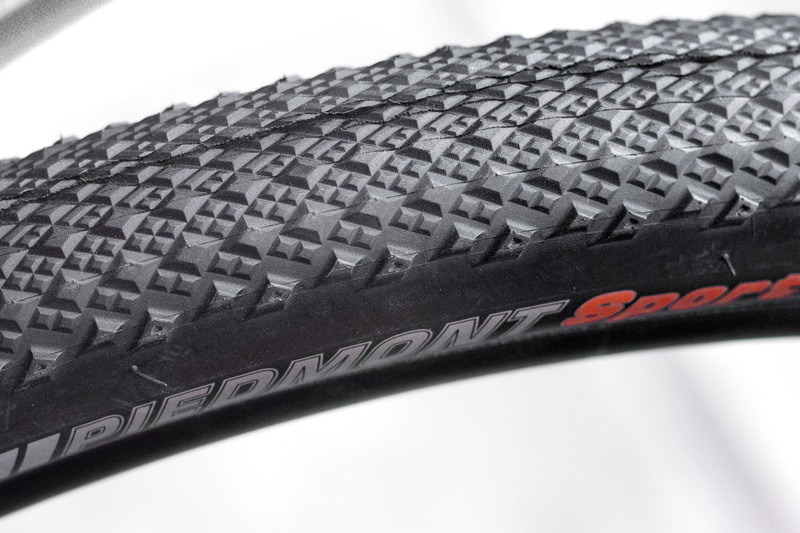 The Piedmont Sport looks like a fine fast-rolling option that comes in 700c x 35mm and 40mm options in a 30 tpi casing. 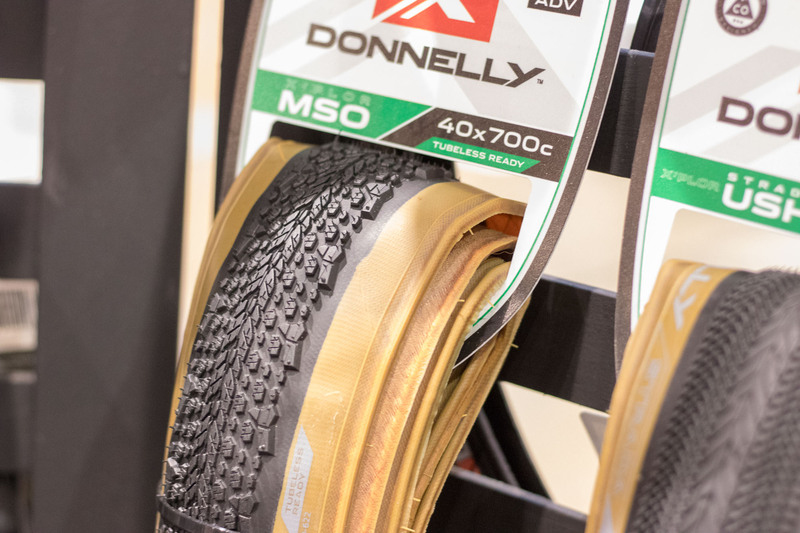 Donnelly has been hard at work on its new bikes, but that doesn’t mean its tires have been on holiday, despite their new tan. The existing gravel tires have a new tan wall option. Look closely and you’ll see there’s a black sheep in that flock. 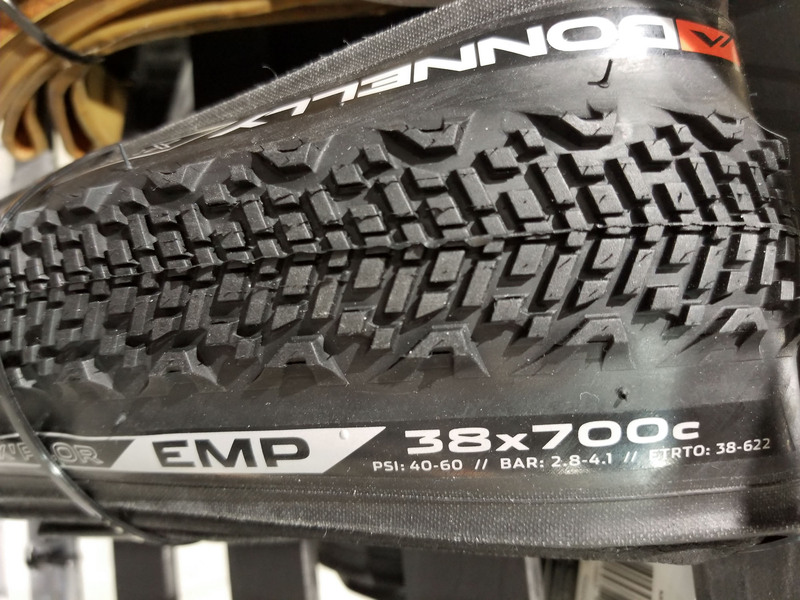 That new tread is the EMP, a knobby gravel tire named after Emporia, Kansas, where a few people go on leisurely gravel rides each year and get dirty – aka Dirty Kanza. 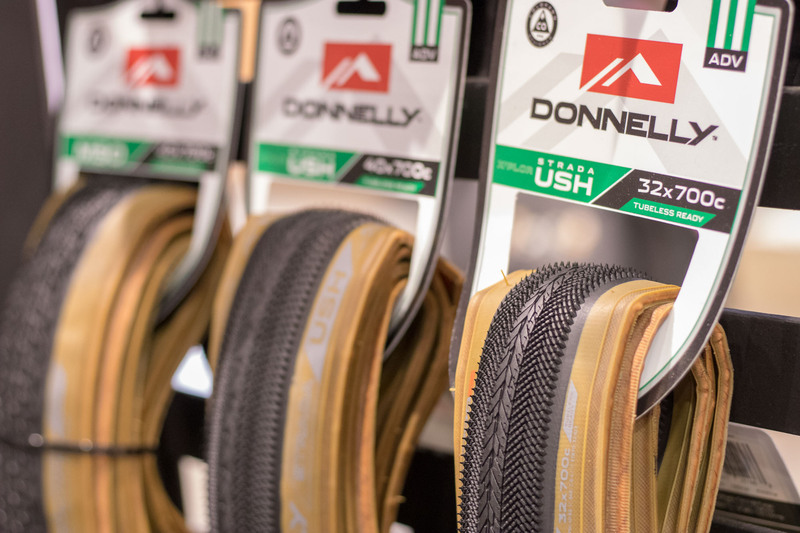 When we weren’t looking, the Kona and Maxxis/Shimano cyclocross teams have merged, and one impact of this combination of sponsors is that Kona riders are now riding Maxxis tubulars. Maxxis was not displaying its tubular options at the show, though. 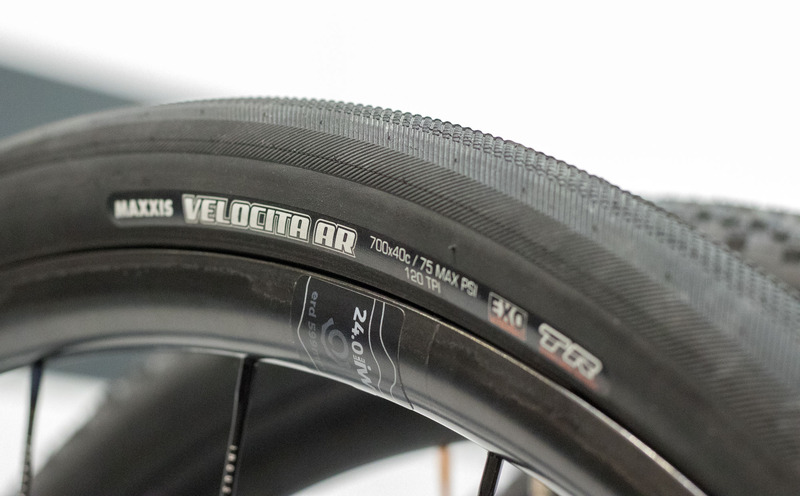 The company was showing off a new gravel option in the form of the Velocita AR (all road). While the company already has the burly, slick Refuse 40mm tire, the new fast-rolling Velocita comes in lighter EXO and Silk Shield casings and has a micro knob center option. 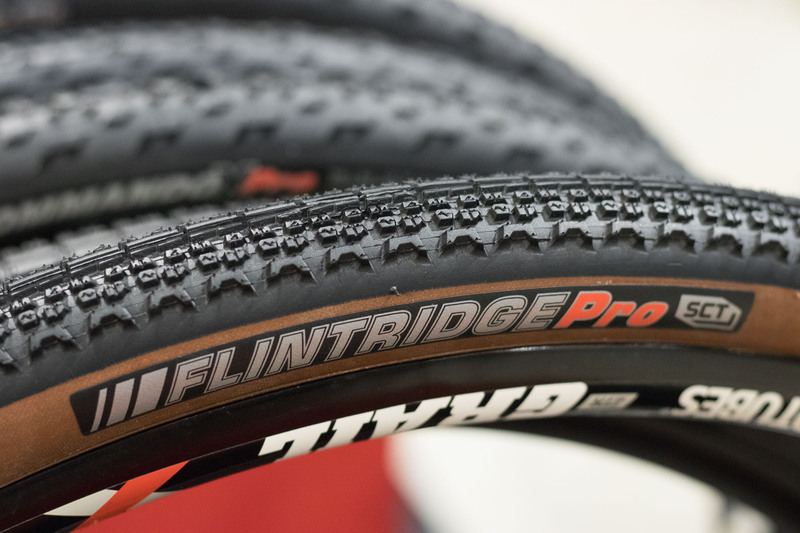 Challenge has finally sealed the deal by embracing tubeless this year. At Sea Otter, we took a first look at its new tubeless tires and reviewed the tubeless Gravel Grinder tire this summer. 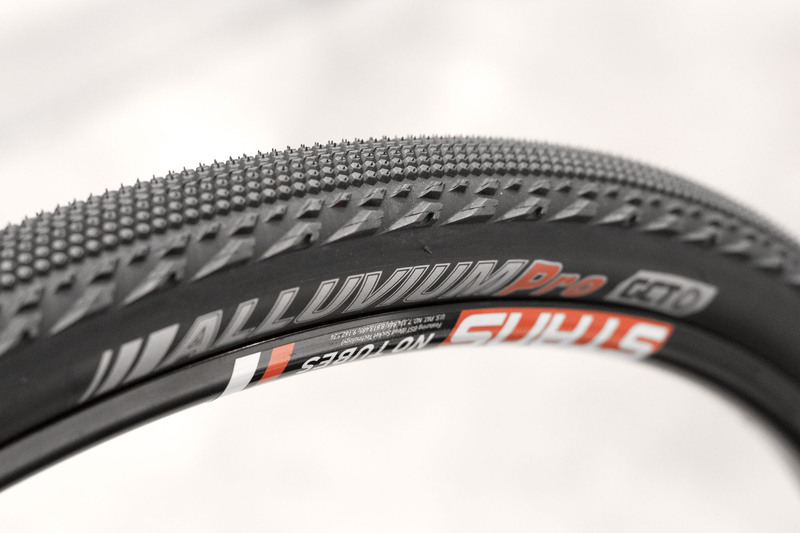 Now the popular Grifo and Limus treads are available soon in a tubeless casing. 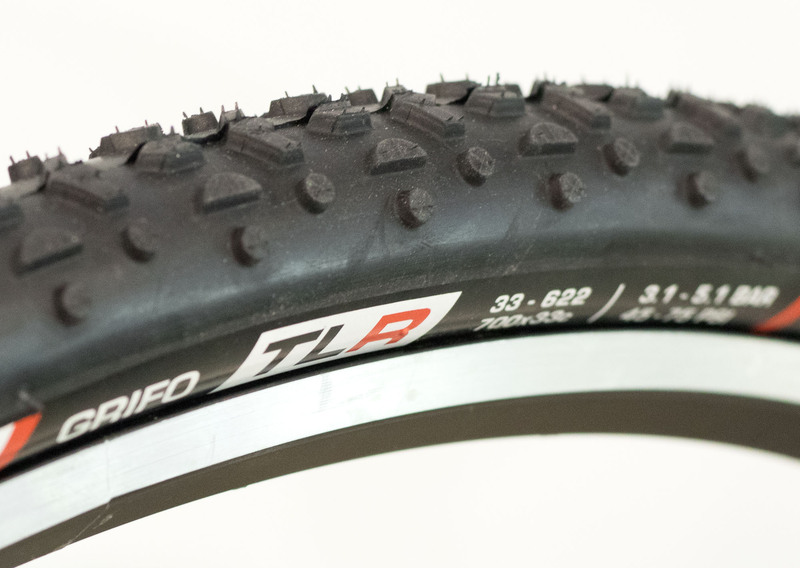 Like other brands, Challenge uses the TLR casing to designate tubeless models. The tires are supposed to be available this October. We’re anxiously awaiting a review set. Stay tuned.